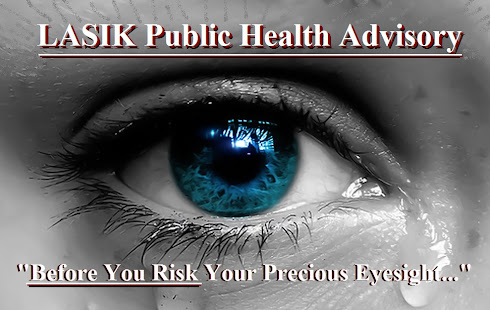 LASIK PUBLIC HEALTH ADVISORIES ISSUED: : Harvard Medical Professor, Dr. Perry Rosenthal, Reports: "21% of LASIK Eyes Permanently Damaged!" 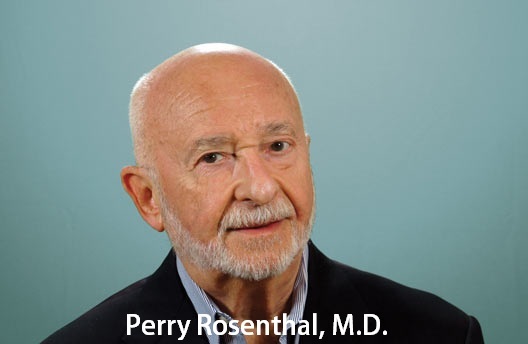 Harvard Medical Professor, Dr. Perry Rosenthal, Reports: "21% of LASIK Eyes Permanently Damaged!" To characterize the clinical features and identify possible factors predictive of long-term, severely disabling corneal pain often associated with photophobia following laser keratorefractive surgery. Data from the medical records of 100 consecutive patients diagnosed with centralized corneal pain were screened retrospectively. Those of 21 patients who had previously undergone laser keratorefractive surgery were identified and reviewed. Characterization of long-term corneal neuropathic pain following laser keratorefractive surgery and assessment of possible risk factors. The duration of putative centralized corneal neuropathic pain exceeded 2 years at the time of our initial consultation in all patients. This cohort consisted of 15 women and 6 men. 62% of patients reported a pain-free interval between the resolution of surgical pain and onset of chronic corneal pain which ranged from 3 days to 15 years. Excluding the 15 year outlier, the median delay in the onset of chronic pain following LKS was 1.5 years. 14 of 17 patients who had worn soft contact lenses prior to surgery had developed intolerance to these devices. Of the 4 patients without a prior history of soft contact lens wear, 2 reported notable chronic pre-operative dry eye-like symptoms prior to surgery. 3 of the 15 female patients in this cohort were subsequently diagnosed with Sjogren’s syndrome. Extensive corneal axotomies associated with laser keratorefractive procedures can trigger a chronic trigeminal pain syndrome consistent with centralized neuropathic corneal pain and distinct from that characterized by post operative dry eye-like symptoms which typically resolve within a year. The recognition that centralized neuropathic corneal pain can be a complication of laser keratorefractive surgery is the first step to developing mechanism-based treatments for this overlooked, crippling and currently intractable neurological complication. The authors have no proprietary or commercial interests in any material discussed in this article. Corneal axotomy can result in neuropathic pain mechanistically and clinically akin to that observed in other somatic areas following healing of surgical procedures. The human cornea may be especially vulnerable to this disease considering its unrivaled density of nociceptors 1, their significantly lower activation thresholds 2 and unusual vulnerability to being exposed to the noxious environment. That complications of axotomized corneal nerves can include severe, chronic (and perhaps permanent) neuropathic pain in susceptible patients is not surprising 3. The insight that dry eye-like symptoms is a form of corneal pain 4 points to the corneal nociceptive system as an important player in the spectrum of disorders collectively labeled as dry eye disease. It has been suggested that chronic dry eye-like symptoms (DELS) following laser keratorefractive surgery (LKS) are the result of reduced tear secretion cause by impaired function of the afferent limb of the functional lacrimal unit 5. Nevertheless, this model often fails to explain many of its clinical features 6; especially the disparity between the high intensity of symptoms and paucity of external signs 7 which was a uniform finding in this cohort. On the other hand, a recently proposed neuropathic model for otherwise unexplained chronic corneal pain ± photosensitivity 8 is supported by these enigmatic findings and highlights a rare, previously unreported and devastatingly painful complication of massive axotomies caused by laser keratorefractive surgery. The charts of 100 consecutive patients who experienced inadequately explained, disabling chronic corneal pain that was either incompletely suppressed while their corneas were immersed in a pool of artificial tears (created by a fluid-ventilated scleral lens) and/or who were inexplicitly intolerant of these devices were reviewed retrospectively. 21 patients in this group were identified as having undergone prior LASIK or photorefractive keratectomy (PRK). As in the larger cohort, all patients in the post-LKS group were presumed to suffer from cornea-projected (phantom) pain as defined by the presence of signs and symptoms consistent with neuropathic changes in the central pain-signaling pathways. Pain-focused medical histories and eye examinations, including laser in vivo confocal microscopy (LVCM) and central Cochet-Bonnet esthesiometry, had been routinely recorded in the charts of all patients. 35 eyes of 18 patients had undergone LASIK, 4 eyes of 2 patients had been treated with photorefractive keratectomy (PRK) and one patient had undergone LASIK and PRK in fellow eyes. The median age at their initial consultation was 44 years and ranged from 25 to 60 years. The duration of the chronic ocular pain ± neuropathic photosensitivity at the time of the initial visit varied from 2 to 15 years (See tables 1 and 2 for summary of histories and findings). Corneal neuropathic pain (CNP) had transitioned seamlessly from acute post operative pain in 8 patients (38%) whereas in 13 (62%) the onset of chronic corneal pain was preceded by a post-surgical asymptomatic interval that ranged from 3 days to 15 years (see table 3). The patient with the longest latency was subsequently diagnosed with Sjogren’s syndrome. Of the 13 patients who experienced delayed onset chronic corneal pain, symptoms consistent with centralized pain had commenced spontaneously in 10. In the remaining 3 patients, 1 related its onset to an acute exposure to toxic levels of chlorine fumes, a second to the development of presumed bilateral adenovirus keratitis in a background of Sjogren’s syndrome and the third was subsequently diagnosed as having Sjogren’s syndrome. The duration of the disease at the initial consultation exceeded 2 years in all patients. 20 of 21 subjects in this cohort were intolerant of scleral lens wear and some reported an unusually painful response to Schirmer’s tests. 4 of 17 patients who had developed soft contact lens intolerance prior to surgery reported dry eye-like symptoms (DELS) while not wearing the devices. Photoallodynia (neuropathic photosensitivity unsupported by external signs8) was noted by 17 (81%) patients. 95% of patients described symptoms consistent with corneal hypersensitivity to tear evaporation (corneal evaporative hyperalgesia 8), 38% reported hypersensitivity to fumes and chemicals (chemical hyperalgesia) and 62% experienced extraterritorial comorbid pain in their head (headaches), face, ears, teeth and/or temporomandibular areas. The average level of pain was reported as no less than 6 on the visual analogue scale (0 represents no pain and 10 describes worse possible pain). Despite the intensity and unrelenting nature of symptoms, corneal staining was absent in 27 of the 41 eyes (66%). Of the 14 with corneal staining, 11 were graded as 1+ (Oxford scale), and 2 exhibited 2+ and 3+ staining respectively (Table 3). The intensity of the pain strikingly exceeded that predicted by the status of their corneal epithelium in all patients. Central corneal Cochet-Bonnet corneal metrics were reduced in 53%. The high density of corneal nociceptor terminals and their vulnerability to exposure would be expected to increase the vulnerability of the corneal pain system to developing aberrant anatomical and functional neuroplastic changes in its peripheral10 and central 11 circuitry that underlie neuropathic pain. The massive axotomies performed during LKS trigger inflammation and the consequent release of nociceptor-sensitizing proinflammatory cytokines that cause corneal hyperalgesia 9. The resulting hypersensitivity and hyper-responsiveness to noxious stimuli may include corneal evaporative hyperalgesia (hypersensitivity to tear evaporation.) Moreover, nerve injuries trigger a phenotypic switch in their somata from conduction to regenerative states that initiate the expression of hypersensitive and hyper-responsive ectopic pain generators 10 which are transported to and embedded in the neural membranes of regenerating axon terminals (sprouts and microneuromas) 11. Notably, it is the regenerating nerve terminals that are most responsible for post surgical pain following injuries. Observations of the persistence of active nerve fiber regeneration and inflammation long after these corneas have appeared to have healed likely are plausibly cause by continued nociceptor sensitization and evaporative hyperalgesia despite the presence of reduced corneal tactile sensitivity 12. Post operative symptoms of dry eye-like corneal pain typically resolve within a year 13. On the other hand, patients described in this study differ from those who experience “typical” post LSK dry eye-like pain in a number of ways, including higher intensity, descriptors such as burning, aching, pressure, stabbing and in many of these patients, the presence of otherwise unexplainable photosensitivity (photoallodynia). Moreover, this type of trigeminal neuropathic pain can involve receptive fields beyond that of the ophthalmic branch of the trigeminal nerves. Anecdotal observations suggest that centralized corneal neuropathic pain following LKS is rare. This begs the question of why some people are susceptible to this complication. Vulnerability to neuropathic pain is believed to be influenced by certain genetic and epigenetic factors 14 and efforts to develop useful predictive tests continue 15, including measurements of a individual’s endogenous sensitivity to pain 16. The transition from physiological (reversible) central sensitization to pathological (neuropathic) centralized pain is believed to be caused in part by a failing central inhibitory system in which descending inhibitory signals that are normally increased in response to increased barrages of ascending pain activity causing disinhibition. Entrenched disinhibition is believed to be due to changes of maladaptive neuroplasticity in the central nociceptive pathways17. It is tempting to speculate that figures 4a, b, and c (of different patients) represent 3 stages of evolution to centralized corneal neuropathic pain beginning with ectopic/inflammatory corneal pain and evolving to increasingly intense symptoms as central sensitization becomes hard-wired and self-sustaining, even as the peripheral corneal neural network may have recovered its normal morphology. Nevertheless, its mechanisms are complex, poorly understood and likely differ among patients. Figure 4a: Confocal image of a 47 y.o female who underwent PRK 3 years previously reveals numerous activated dendritic cells and excessive branching of nerve fibers. Figure 4b: Confocal image of a 52 y.o male who underwent LASIK OU 7 years previously shows increased branching of nerves in the subbasal plexus and a striking increase in activated dendritic cells in close proximity with the nerve fibers. Figure 4c: Confocal image of a 44 y.o female who underwent LASIK OU 11 years previously. She suffers from intense symptoms of CCNP despite the absence of signs of axonopathy, nerve regeneration or inflammation, thus indicating the autonomy of CCNP. Responsiveness to corneal anesthesia can sometimes be helpful in distinguishing between chronic peripheral and hard-wired centralized pain. Although incomplete or absent pain suppression support its central origin, total anesthetic suppression does not exclude this diagnosis since centralized corneal pain can be extinguished in some patients but only to lose this effect only to reoccur (personal observations). Increased mechanosensitivity of the bulbar conjunctiva (putatively, secondary hyperalgesia that precludes wearing scleral lenses), tactile allodynia of the skin and spontaneous pain that persists even in the presence of normal corneal nerve morphology (Fig.4c) indicate involvement of the central pain signaling circuitry independently of corneal pain signals 18-20. This has been reported following surgery involving other somatic areas 21. The pain-free intervals between the resolution of post surgical pain and onset of neuropathic pain experienced by most patients in this cohort is a surprising finding and suggests that LKS may act as a priming event that further increases patients’ vulnerability to subsequent development of centralized corneal neuropathic pain that can occur spontaneously or can be triggered by a subsequent noxious event. The considerable inter-patient variability in its clinical expressions (personal observations) fits the model of an open complex system in which the dysregulation of any of its numerous subsystems can affect the behavior of the system as a whole in unexpected ways 22. As a result, centralized neuropathic pain is likely to have a distinctive fingerprint in each patient in terms of its clinical expression and responsiveness to treatments. What can be done to reduce the incidence and severity of post LKS CCNP? Since autoimmune diseases are known to be associated with a higher incidence of peripheral neuropathies, we believe that the possible presence of these disorders or its history in immediate family members should be considered as red flags. Reports that delayed treatment of post operative pain has a deleterious effect on pain outcomes 23 suggest that post LKS pain should be treated aggressively and perhaps even preemptively. In this context, early interventions that accelerate corneal epithelial and nerve healing and suppress inflammation may also be helpful in avoiding the transition to centralized corneal neuropathic pain. Because of the devastating nature of this complication the search for effective topical analgesics capable of being used safely prior to and for an extended period of time after surgery is, in my opinion, a high priority. How should established CCNP be treated? Since its primary pathophysiology is putatively associated with entrenched hyperexcitability of the central pathways, we believe that downregulating the hyperexcitability of the central pain signaling circuitry adequately and long enough to reverse the maladaptive neuroplasticity responsible for perpetuating the disease should be considered the ultimate therapeutic objective24. Systemic neuropathic pain analgesics can sometimes be modestly helpful for patients capable of tolerating their side effects at therapeutic levels 25. On the other hand, we argue that opiates should be avoided because, in addition to their questionable long-term effectiveness, they may eventually increase the intensity of pain because of changes they can induce in the brain 26. Nevertheless, it seems logical for the treatment strategy to include minimizing afferent corneal nociceptive activity to the extent possible. Topically administered nerve growth factor such as found in autologous serum 27 is a possible candidate 28 for some. Other drugs that that appear to accelerate corneal nerve regeneration 29 may also be of interest. We believe that this is the first description of a complication of keratorefractive surgery consistent with the syndrome of centralized corneal neuropathic pain. Awareness of this currently treatment-refractory, severely disabling disease that promotes ideations of suicide in many of its victims (personal observations) is the first step to developing effective, mechanism-based treatments. This effort will require the collaboration of clinicians, cornea-focused researchers and neuroscientists. We wish to acknowledge David Borsook MD, PhD whose mentorship made this paper possible. 1. Mueller LJ, Vresesn GF, Pels L, Cardozo BN, Wilkens B: Architecture of human corneal nerves. Investigative ophthalmology & visual science 1997, 38:985-994. 2. Bessou P, Perl ER: Response of cutaneous sensory units with unmyelinated fibers to noxious stimuli. Journal of neurophysiology 1969, 32(6):1025-1043. 3. Kehlet H, Jensen TS, Woolf CJ: Persistent postsurgical pain: risk factors and prevention. Lancet 2006, 367(9522):1618-1625. 4. Belmonte C: Eye dryness sensations after refractive surgery: impaired tear secretion or “phantom” cornea? J Refract Surg 2007, 23(6):598-602. 5. Turu L, Alexandrescu C, Stana D, Tudosescu R: Dry eye disease after LASIK. J Med Life 2012, 5(1):82-84. 6. Patel S, Alio JL, Artola A, Martinez MJ: Tear volume and stability after LASIK. J Refract Surg 2007, 23(3):290-298. 7. Schein OL, Tielsch JM, Munos B, et al: Relation between signs and symptoms of dry eye in the elderly: a population-based perspective. Ophthalmol 1997, 104:1395-1401. 8. Rosenthal P, Borsook D: The Corneal Pain System Part 1: The missing piece of the Dry Eye Puzzle. Ocul Surf 2012, 10(1):2-14. 9. Sommer C, Kress M: Recent findings on how proinflammatory cytokines cause pain: peripheral mechanisms in inflammatory and neuropathic hyperalgesia. Neuroscience letters 2004, 361(1-3):184-187. 10. Xiao HS, Huang QH, Zhang FX, Bao L, Lu YJ, Guo C, Yang L, Huang WJ, Fu G, Xu SH et al: Identification of gene expression profile of dorsal root ganglion in the rat peripheral axotomy model of neuropathic pain. Proc Natl Acad Sci U S A 2002, 99(12):8360-8365. 11. Belmonte C, Carmen Acosta M, Gallar J: Neural basis of sensation in intact and injured corneas. Experimental Eye Research 2004, 78(3):513-525. 12. Benitez del Castillo JM, Acosta MC, Wassfi MA, Diaz-Valle D, Gegundez JA, Fernandez C, Garcia-Sanchez J: Relation between corneal innervation with confocal microscopy and corneal sensitivity with noncontact esthesiometry in patients with dry eye. Investigative ophthalmology & visual science 2007, 48(1):173-181. 13. Murakami Y, Manche EE: Prospective, Randomized Comparison of Self-reported Postoperative Dry Eye and Visual Fluctuation in LASIK and Photorefractive Keratectomy. Ophthalmology 2012, 119(11):2220-2224. 14. Costigan M, Belfer I, Griffin RS, Dai F, Barrett LB, Coppola G, Wu T, Kiselycznyk C, Poddar M, Lu Y et al: Multiple chronic pain states are associated with a common amino acid-changing allele in KCNS1. Brain : a journal of neurology 2010, 133(9):2519-2527. 15. Martinez V, Ben Ammar S, Judet T, Bouhassira D, Chauvin M, Fletcher D: Risk factors predictive of chronic postsurgical neuropathic pain: The value of the iliac crest bone harvest model. Pain 2012, 153(7):1478-1483. 16. Tousignant-Laflamme Y, Page S, Goffaux P, Marchand S: An experimental model to measure excitatory and inhibitory pain mechanisms in humans. Brain Res 2008, 1230:73-79. 17. Cao J, Yang X, Liu YN, Suo ZW, Shi L, Zheng CR, Yang HB, Li S, Hu XD: GABAergic disinhibition induced pain hypersensitivity by upregulating NMDA receptor functions in spinal dorsal horn. Neuropharmacology 2011, 60(6):921-929. 18. Navarro X, Vivo M, Valero-Cabre A: Neural plasticity after peripheral nerve injury and regeneration. Progress in neurobiology 2007, 82(4):163-201. 19. Devor M: Response of nerves to injury in relation to neuropathic to neuropathic pain. In: Wall and Melzack’s Textbook of Pain. 5th Edition edn. Edited by McMahon S, Koltzenburg M. London: Churchill Livingstone; 2006: 905-927. 20. Ji RR, Kohno T, Moore KA, Woolf CJ: Central sensitization and LTP: do pain and memory share similar mechanisms? Trends Neurosci 2003, 26(12):696-705. 21. Borsook D, Kussman BD, George E, Becerra LR, Burke DW: Surgically Induced Neuropathic Pain: Understanding the Perioperative Process. Ann Surg 2012. 22. Apkarian AV: The brain in chronic pain: clinical implications. Pain Manag 2011, 1(6):577-586. 23. Lynch ME, Campbell F, Clark AJ, Dunbar MJ, Goldstein D, Peng P, Stinson J, Tupper H: A systematic review of the effect of waiting for treatment for chronic pain. Pain 2008, 136(1-2):97-116. 24. Seminowicz DA, Wideman TH, Naso L, Hatami-Khoroushahi Z, Fallatah S, Ware MA, Jarzem P, Bushnell MC, Shir Y, Ouellet JA et al: Effective treatment of chronic low back pain in humans reverses abnormal brain anatomy and function. The Journal of neuroscience : the official journal of the Society for Neuroscience 2011, 31(20):7540-7550. 25. Clarke H, Bonin RP, Orser BA, Englesakis M, Wijeysundera DN, Katz J: The prevention of chronic postsurgical pain using gabapentin and pregabalin: a combined systematic review and meta-analysis. Anesth Analg 2012, 115(2):428-442. 26. Younger JW, Chu LF, D’Arcy NT, Trott KE, Jastrzab LE, Mackey SC: Prescription opioid analgesics rapidly change the human brain. Pain 2011, 152(8):1803-1810. 27. Bradley JC, Simoni J, Bradley RH, McCartney DL, Brown SM: Time- and temperature-dependent stability of growth factor peptides in human autologous serum eye drops. Cornea 2009, 28(2):200-205. 28. Lambiase A, Sacchetti M, Bonini S: Nerve growth factor therapy for corneal disease. Current opinion in ophthalmology 2012, 23(4):296-302. 29. Zagon IS, Sassani JW, Carroll MA, McLaughlin PJ: Topical application of naltrexone facilitates reepithelialization of the cornea in diabetic rabbits. Brain Res Bull 2010, 81(2-3):248-255. The Journal of Cataract and Refractive Surgery.